Voters waiting in queue outside a polling station in Lakhimpur on Wednesday. Photo credit: Northeast Now. 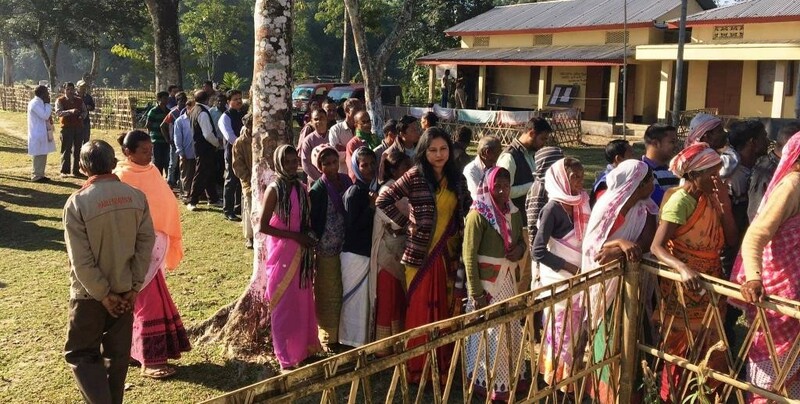 The first-phase Panchayat election held across Lakhimpur district in Assam today was marred by large-scale irregularities and chaos with suspension of voting in various polling stations where hundreds of voters found their names missing in the electoral roll and demanded for re-poll. In No. 2 and No. 3 Bogoleejan polling stations on the outskirts of North Lakhimpur, 80 to 100 names of voters were found missing from the electoral . In Zoihing Gaon Panchayat polling stations like Girza Line and Zoihing Labour Club, Staff Line and Koilapathar, No. 15 Line polling had to be suspended till 1 pm as names of hundreds of voters were found missing in electorate rolls. Angry voters protested outside the polling stations forcing the polling personnel to hold-up poll. Phanidhar Baruah, the district president of BJP who was present outside the polling station of Zoihing Labour’s Club, told this correspondent that Lakhimpur district administration had not been responsible for that as the electoral rolls were printed within a very limited period of time. Chandra Chutia, the Congress candidate contesting for the Leelabari ZPC alleged that the state machinery had deleted the names of those voters who had been traditionally Congress supporters. In Dhakuwakhona LAC area rigging was alleged in Medhi Suti polling station. In East-Telahi (Ward-5), Balijan-Gamchuk and Na-Ali (Ward-3) polling stations wide-spread rigging was alleged by Congress. Dr. Joy Prakash Das, Lakhimpur District Congress Committee president, alleged that these polling stations, which had been marked as sensitive, armed security were not provided by the district administration despite repeated appeals by him. He demanded re-poll in these polling stations. In West-Telahi (Ward-5, 6 and 8) polling stations rigging was alleged along with dropping of voter’s names including that of contesting candidates. In No-5 ward of West-Telahi Gaon Panchayat angry voters, whose names were found missing from the electoral roll, forced the polling personnel to suspend voting mid-way. Mass rigging was also alleged in Kopak Chapori polling station in Ghunasuti Gaon Panchayat of Lakhimpur. There was chaos in four polling stations of Bosagaon Gaon Panchayat where 400 voters’ names were missing from the electoral roll. In Nowboicha LAC, voting was suspended intermittently in Mazgaon polling station for the same reason.